HVAC has always been a predominantly seasonal industry. But service agreements have the ability to change all of this by bringing a steady stream of cash into your business. Struggling to sell service agreements to your customers? Check out our top 10 tips for increasing HVAC service agreement sales. Air quality monitors are quite new to the HVAC industry and indoor air quality (IAQ) is a new consideration for customers too. Healthy living is a growing trend, and this doesn’t just include food and exercise, it includes clean air too! ​Air quality monitors can tell customers about the level of pollutants in the air, but they cannot fix it. That is where you come in. When you give customers a free air quality monitor, you can make all of the improvements required to fix the IAQ and then sell clean-air-as-a-service as part of your service agreement. This means that if the air quality monitor ever reports an increase in pollutants in the air, as part of the service agreement, you can fix it for the customer to ensure that they always breathe clean air. ​If you only communicate with your customers when you want money from them, then your relationship isn’t going to be very stable. Take brands on social media as an example. Those that are the most successful aren’t the companies trying to sell in every single message! Don’t be afraid to offer your customers free advice every now and then. By including this as part of your service agreement, you can increase sales and also customer satisfaction. By building trust through free advice, your customers will listen to you. So when you tell them it is relevant to consider a rework, they know that it is. Charts like this can become powerful sales tools as they prove the benefits of service agreements for your current customers, in turn showing new customers what they can expect. ​One great way to sell service agreements is to encourage your current customers to do it for you. Word-of-mouth is such a precious sales tool because people are much more likely to trust the opinion of a loved one over the marketing material of a business. According to recent studies, people are 4x more likely to buy when referred by a friend, and the lifetime value for new referral customers is 16% higher than non-referrals! To entice your current customers to spread the word about your HVAC service agreements, you could create a referral program that entitles them to benefits every time they refer a new customer to you. This could be money off their own service agreement, or even something not related to HVAC at all, like a gift voucher. Choose something that you think would be a good way to say thank you to your customers. ​If your contractors aren’t excited about your service agreements, then your customers won’t be either. You need to present them with something they believe in, something they themselves would buy, so that they can go out and sell it to customers with enthusiasm. In order for your contractors to get excited about increasing your HVAC service agreement sales, they first need to fully understand and be able to speak confidently about it. Host a short training session with your contractors, giving them all of the information they need and also the opportunity to ask any questions. If your contractors are incentivized to sell service agreements, then it is important that their eagerness does not compromise the message of what you’re selling. 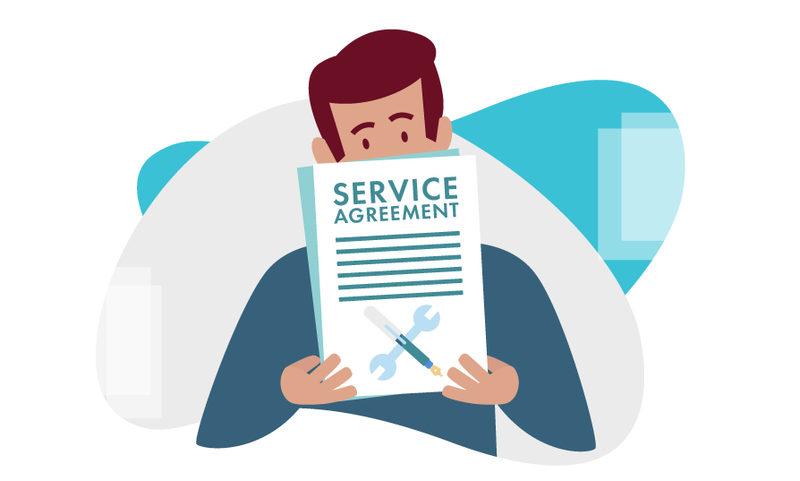 Increasing service agreements isn’t just about increasing your revenue for that year, it is about increasing your customer base for the long-term. And if you want customers to stay with your HVAC company, then is important to be honest from the start. Make sure that there is no ambiguity in the agreement, and be sure to only promise what you can deliver. ​Once you have some customers signed up for service agreements, it can be easy to forget about them and focus on getting new customers to sign up. But existing customers are SO valuable, and you need to treat them as such. According to Bain & Co, increasing customer retention by just 5% can boost profits by 25% or more! Don’t forget about your existing customers, and don’t let them forget about you. Give them a reason to continue renewing their service agreement every year (like a monthly or bi-monthly report of the IAQ), otherwise you could lose them. Any customers who give you a score of 6 or lower are called “detractors”, customers who rate you between 7 and 8 are “passive”, and those who rate you 9 and 10 are “promoters”. Promoters are the people that will help you to develop that all-important word of mouth. To calculate your NPS, you need to subtract the percentage of detractors from the percentage of promoters. A great NPS will help you to increase your HVAC service agreement sales because it will show new prospects how happy your current customers are.